If you have newer windows installed in your home, you might be under the impression they’re already energy efficient. But the truth is that if you don’t have window caulking done properly around your windows, cold air might still be sneaking into your home and dragging your energy efficiency down. By having your windows caulked, you can fix that problem right away and keep your home more comfortable in the process. Check out some other benefits of window caulking below. It prevents moisture from working its way into your home. Outside of worrying about air working its way into your home through the cracks surrounding your windows, you also need to worry about moisture. Moisture can wreak havoc on your home if it’s able to get into it through cracks around your windows. Before long, mold and mildew could start to grow. Window caulking will prevent moisture from getting in at any point. It stops pests from gaining easy access to your home. There are many pests, like ant and mosquitos, that can sneak into your home when you don’t have fresh window caulking. It’s not uncommon for a tiny crack near a window to lead to an insect infestation inside your home. By caulking your windows, you’ll keep the pests out and avoid having to pay hefty fees for pest control services. It extends the lifespan of your home’s windows. Most of today’s windows are designed to last anywhere from 20 to 40 years. However, they won’t last you that long if you don’t maintain them properly. 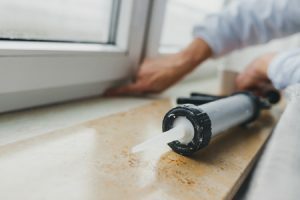 In addition to cleaning your windows and window frames and fixing any broken hardware on them, you should also have window caulking done regularly. It’ll ensure your windows last for many years to come. Roofing by Bruce can set you and your home up with a bunch of window and siding services, including everything from window replacement and window wrapping to window caulking and siding repairs. Call us at 570-424-8891 today if you’re interested in having your windows caulked.